The amazing response to our Nepal Earthquake Appeal has already helped hundreds of people with immediate relief of food and tarpaulin. We will maintain the relief supplies for three months until the next harvest and are now replicating our relief work in another district. But it’s a race against time. We are desperate to ensure their safety and build them a house. Thanks to all of your donations we’re already able to make a huge change. We have a plan! We are purchasing and transporting materials now to start building the first 50 earthquake resistant homes for people like the family pictured above. Samjhana is a seven year old girl who we care for at our hostel. Samjhana’s parents have four daughters and grow rice. 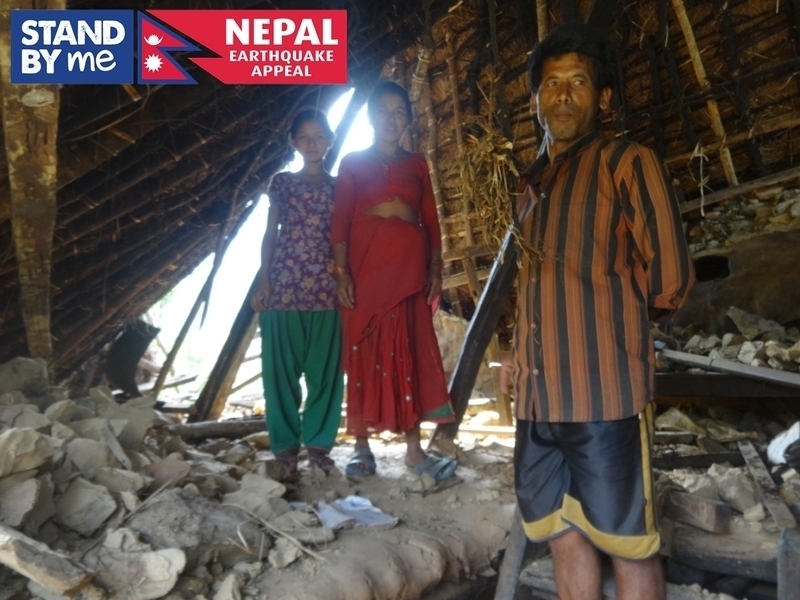 When the first earthquake struck, their house collapsed, it is now filled with rubble and is dangerously unstable. Samjhana’s father suffered a stroke and is not physically well enough to work, he has no hope of rebuilding his house without our help. The new earthquake resistant homes will cost £700 each and provide security, protection and hope to the people in the Khairang. Thank you to everyone who has generously given so far, we really couldn’t do it without you. There are many more families like Samjhana’s, living under tarpaulin, exposed and in extreme need. It’s not too late for you to help. Every penny from our Nepal Earthquake Appeal will go to provide relief and long term support to people just like Samjhana’s family.